We exclusively confirmed last month that Samsung would be launching a cryptocurrency service with the Galaxy S10. Several live images of the Galaxy S10 have now leaked online which confirm the Samsung Blockchain KeyStore app. Our report mentioned that the cryptocurrency service would be split into two parts. There will be a cold wallet for saving digital currencies, public and private keys, and signing private keys for transactions. There’s also going to be a crypto wallet for viewing account information, transfers and transaction history. 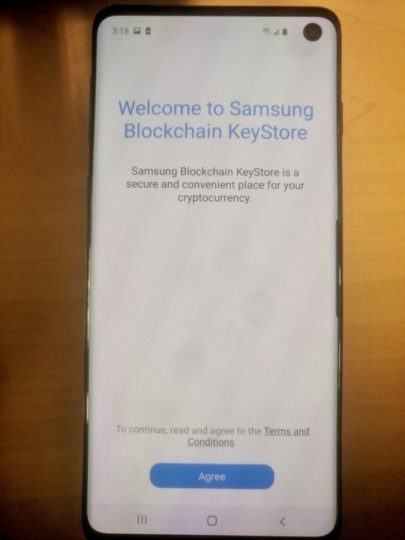 The images show the Samsung Blockchain Keystore app running on the Galaxy S10. The splash page mentions that this app is a “secure and convenient place for your cryptocurrency.” As we detailed in our report, the images also show that the app will let users import an existing wallet while also being able to create a new one. Ethereum is listed as a supported cryptocurrency but it will have support for Bitcoin, Ethereum-derived token ERC20 and Bitcoin Cash at launch. There’s also going to be a relevant menu item for Blockchain KeyStore in the Settings app under the Biometrics and security section. It mentions that the service lets users secure and manage their blockchain private key. All of these features have been discussed by us in depth in our exclusive report. These images are also the clearest live shots of the Galaxy S10 that we have seen so far. The single front camera gives away the fact that this is a Galaxy S10 and not a Galaxy S10+. We can see that the bezels are quite minimal which is something that many Samsung fans will appreciate. 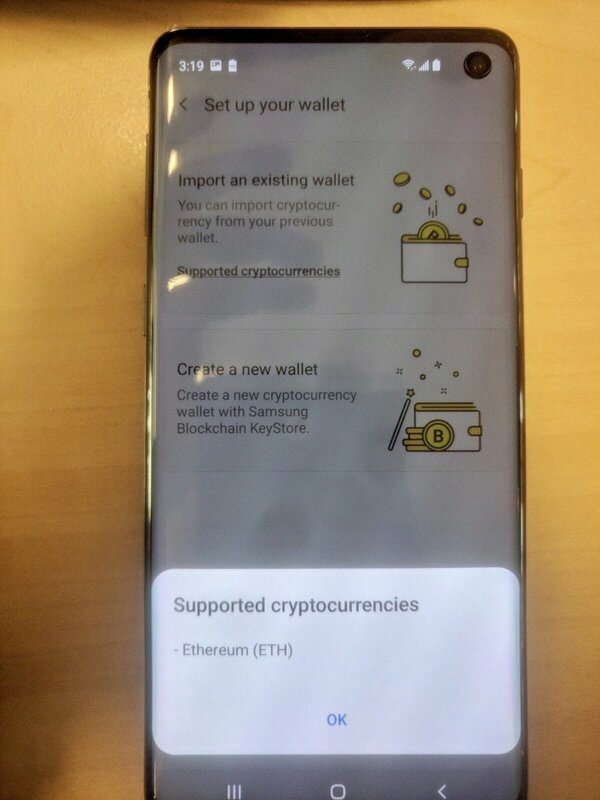 Do you think it’s a good thing that Samsung is shipping a cryptocurrency service with its next flagship? Share your thoughts with us in the comments below. It looks like there is screen protector. Even the s10+ leak was photoshoped to remove the chin! Yeah, don’t fall for the renders, they aren’t an accurate representation.